It’s been a week today since the developer preview of Windows 8 was released at the Build conference. I wasn’t able to go myself, but Sogeti did have consultants in attendance. The rest of us were glued to the streaming content. My emotions are mixed, but I realize this is just a preview. My biggest issue right now is being able to get to the start, shutdown restart and power settings when you are in an application, or bring up the IE 10 controls when using a mouse, but I am probably not devoting a great deal of time to the OS from a usability perspective. It seems to me that you should also be able to do the same thing with your mouse that you can do with your finger, such as grabbing a section of screen and dragging it sideway instead of using a scrollbar. I am more interested in the technology behind the OS, what is going to be compatible on the different platforms with Intel and ARM processors. I installed the Windows 8 developer preview on my Acer Iconia TAB W500. Of the machines I have tested, the Acer just can’t be beat for the price point of $500. The Acer runs Windows 7 really well, with good battery life. On Windows 8 it is very fast. I don’t think the reviews on the Iconia TAB W500 have been very fair, I find it a very capable companion device. The included keyboard dock is nice, but doesnt include much more than a network jack and additional USB ports. Did I mention it was $500? I upgraded the SSD in mine to 64Gb from the original 32Gb. I have been carrying the Iconia TAB around to show people what the future of Windows might look like. I was able to install Windows 8 keeping my domain membership and files with no issues at all. The only hickup of the transition I encountered was that I had to re-install the Bluetooth drivers from the Acer website and at present I have been unsuccessful at getting the screen rotation drivers to activate. 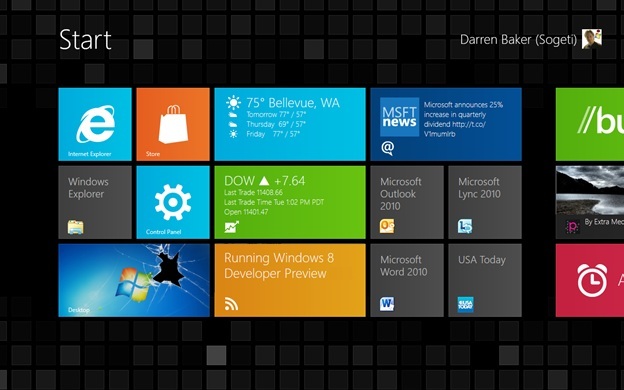 The blogs were all lit up last week as people picked Windows 8 apart. Apparently there are lots of customization features missing and it seems that within days of the release, people had already figured out how to change the start screen metro colors and disable the metro start screen altogether, restoring the Windows 7 style start menu. I seriously miss the full on start menu when in desktop mode for access the “other” icons, applications and features. I realize the Start Page is good for touch and at a glance information, but it seems to take longer to get things done that it does with a standard keyboard and mouse. I have been using Windows 7 on my ASUS and ACER slates, and when not docked with a keyboard and mouse I am not as productive. But then, isn’t the purpose of the system in tablet mode portability and access? When I am mobile, I am only consuming data or sharing pre-created content with others. The only time I am actually creating in tablet mode is when I am taking notes with OneNote, responding to email or working with a document that isn’t complex. What I think these devices do well, is the transition from a consumption device to a production device. If Windows 8 can address the transition gracefully, and the OEM’s can give us devices that are lighter with longer battery life, we just might have the enterprise class computing businesses can use.